Ignores the archive bit, backs up all files. Resets the Archive bit, but only if incremental or differential backups are to be supported. Differences since last full backup or last incremental backup. Backs up if the Archive Bit is set: The operating system sets the archive bit when a file is created or changed. Re-sets the Archive bit, so the file will only be re-selected for backup if it changes before the next backup. Backup differences since last full backup. Backs up if the Archive Bit is set. Leaves the archive bit alone so each differential backup backs up differences since the last full backup. This way of backing up means that you cannot have more than one program backing up the same data if only differences are to be backed up each time, e.g. a job, called 'Everything' , that backs up the differences of all files will reset the archive bit of the files in the Documents folder, another backup job which is only designed to backup the changed documents will not detect any changes because the 'Everything' job has reset the archive bit. The work around is to make the Documents backup always run a full backup which does not reset the archive bit. If you would like to see the attributes use Windows Explorer to display a list of files in 'Details' mode (so you can see the name, size, type and date modified), right click the heading bar and choose Attributes. The A indicates that the Archive Attribute is set. For your information the other attributes are: R = Read only, H=Hidden (if you can see them), S=System File (these too are are normally hidden - see the menu option Tools / Folder Options / View / Show Hidden Files and Hide Protected...). AISBackup does not use the archive bit when backing up, and leaves it alone so as not to upset any other backup program you may run. When it comes to restore: AISBackup shows you all files that exist on the chosen session, as opposed to just the files that were physically backed up. AISBackup does not do what is known as Differential backups because it makes no sense for AISBackup. AISBackup does not use the archive bit so multiple backups of the same data may be made without upsetting any legacy backup program which uses the archive bit. The first time a backup job is run AISBackup backs up all selected files and catalogues these files in a file called the Backup Contents File. All files are placed in Session 1 the first time a backup job is run, so put another way Session 1 contains all files that have just been backed up. This is exactly the same as a traditional full backup. Right click in the right hand pane and choose New / Folder and rename the folder AISSess. Create an AISBackup job, choose destination disk, and select the folder C:\AISSess as the source of the backup (New Job / Next / A Local Hard drive or Network Drive / Next / Type SessTest / Next / Next /Next / Select the folder AISSess / Next / Run / Continue). 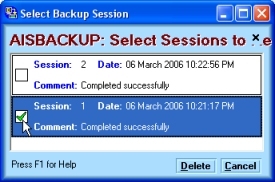 Having run the backup click Restore From Backup, choose All Sessions (the default) and click Next. The restore files selection form shows the same three files. Look at the sessions column, all three files were created in session 1 as denoted by C1, all three files physically reside in zip file 1 as denoted by Z1. From Explorer double click the file New Text Document (2).txt and enter some text, then save this file. Create a new text file, this should be called New Text Document (4).txt. Right click New Text Document (3).txt then while holding the shift key down choose Delete. (shift Delete means delete and not move to recycle bin). Notice that there are now 2 entries for New Text Document (2).txt one Gen(eration) 1 and the other Gen(eration) 0. Gen 1 was created in session 2 and is on zip file 2, Gen 0 is now shown as deleted in session 2, and so is New Text Document (3).txt. Double click each entry of New Text Document (2).txt and you will see that Gen 0 has no data and Gen 1 has data. The New Text Document (4).txt file is shown as created in session 2 (C2). Now from the Restore From Session drop down combo box choose Session 2. You will now only see the files that existed on the PC when session 2 was backed up. Choose Session 1 and you will only see the three zero size files that existed on the PC when session 1 was backed up, i.e. just like the first Select Files to Restore form, above. Another powerful feature of AISBackup is the ability to manually or automatically prune (or remove) redundant backup data (backup data you no longer require). Cancel the restore files form and choose the menu option Manage Backup / Undo Backups (Prune Backup sessions) Check Session 1 then choose Delete and confirm with Yes. You will see that New Text Document (2).txt and New Text Document (3).txt were physically removed from zip file 1 because they are no longer required for any backup session, New Text Document.txt remains in zip file 1 because it is required for session 2. If you were to look at the restore files form again you will notice that all files have been marked as created in session 2, this is because session 1 no longer exists in this backup job. In a multi-session job you may choose any session for deletion, AISBackup knows which files it can physically remove. To continue this tutorial create a new file or two, change the contents of files and delete a few more, switch between sessions to see the file state that existed on the PC at the time the session was backed up. What AISBackup is doing with one or two files in this tutorial it is doing with the whole contents of your PC during a normal backup. Remember that each backup session contains all files that existed on the PC the date the session was made, no need to worry about compiling a list of files to restore from a full backup and several incremental backups (or maybe one differential backup). AISBackup always shows you a full backup view of your files - and that is what you want to restore from unless you are a masochist. If you only want a full backup and the backup destination is a disk AISBackup may be set to retain 1 backup session, then the backup will only contain a full backup of 'now' even though only differences were physically backed up. This only works logically if write once media such as CD or DVD is used as AISBackup cannot physically remove data from these drives, i.e. the backup contents file will show 1 full backup but the expired backup data will still be on the write once media. Backups can be set to automatically prune data based on business work cycles, e.g. keep the last seven days, five weeks and twelve months. Everything that expires from your chosen backup plan is automatically pruned. This keeps the backup destination disk space to a minimum while preserving the data you want.